The Wild Wasabi Textured Cardstock special offer is almost sold out. Contact me soon if you want this special. See details on the specials page on my website (link to right). 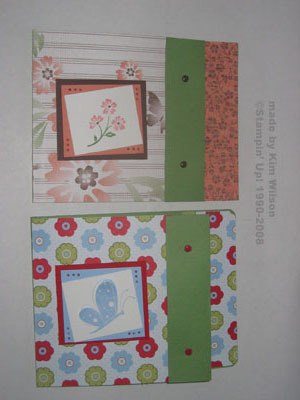 Here are 2 cards that I made today with the prescored cardstock. I trimmed down both sides so the card was 5 1/2 by 4 1/4 (standard invitation size) when folded. This card layout was CASED from SCS. Note how easily I changed out the stamp sets (Dream your Life, Garden Whimsey) and designer paper (Afternoon Tea, Summer Picnic)! The top panel was folded over and secured with brads. The stamped image is tilted and the mat is paper pierced. Designer paper panels are 1 by 4 1/4 and 3 1/2 by 4 1/4.